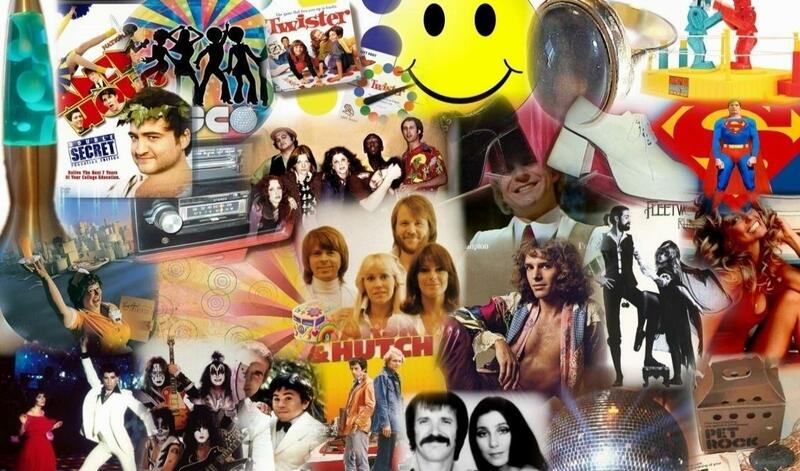 For me, when I think back to my early years the music that comes to my mind is the likes of The Jackson Five, The Osmonds, The Bay City Rollers, Shawaddy Waddy, Slade. I could go on, but I suspect that you get the idea. All Glam Rock and boygroups. Yes, I would listen to them on the radio and know all the words of the songs, but it really didn’t hit home. Then came along the song Popcorn by the group Hot Butter. An instrumental hit that reached number 5 in the UK it made me realise that there was a different sort of music. Popcorn was the first “single” I ever had and it was played over and over. Even then though, I didn’t realise that there was “other” types of music out there. For years my brother had been playing a record quite a lot and quite loudly. Looking back now, for some reason it didn’t gel with me. Several times I remember my brother coming in to my room and telling me that I really should listen to it. Of course, being his brother I ignored him. It must have been sometime between 1978 and 1979 that I came across the cover of The Man Machine. The inner sleeve did mention “voice” but everything else was “electronic” something or other. Of course I bought it. 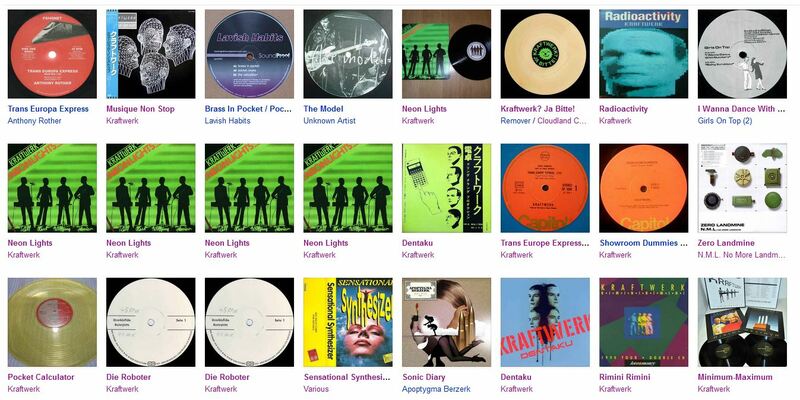 Since that day in the late 70’s I have slowly been amassing a Kraftwerk collection. It crept up on me without me knowing. Initially after hearing The Man Machine, and knowing “this is what I’ve been waiting for”, I searched out their back catalogue. I remember being a bit disappointed with Kraftwerk and Kraftwerk 2 as these records were unlike the LP’s from Autobahn onwards. Ralf and Florian kept me amused for a while though as it was clear that this was a stepping stone for what was to come. A few years later my parents came back from a trip to France and they brought back for me a French version of the Autobahn LP. They said that they hadn’t seen it before and thought it was a new one. What they were referring to, of course, was the cover. Most versions have the Emil Shult painting for the cover while the UK version has the motorway sign. So, no new music to be heard, however I was delighted with a new Kraftwerk item. Then, I realised that Kraftwerk records were being released around the world, and I soon discovered that there were German language versions of the LP’s I have obtained. And so the collection grew. Most of it is catalogued and available here to be seen and searched on. In 1981, July 2 and 3rd, my brother and I went to see Kraftwerk performing at the then Hammersmith Odeon. The space ship out of Star Trek! That is what we saw when the curtain initially opened. An incredible experience that has stayed with me since that day. However Kraftwerk were pretty “shy” when it came to public performances and I was not able to see them again until 1991 when they toured to promote the The Mix LP. At that time I made a report for the newly published Aktivitat fanzine and can be read here. Again, there was a long break, 2004 Kraftwerk were tour quite extensively again. I got to see them at the Brixton Academy. This time they had ditched their “kling klang studio” setup to use more streamlined laptops on stage. The last time I saw them was in 2017 at the Royal Albert Hall where Kraftwerk performed a similar set but had now introduced 3D sound and visual technologies. If there is anything you would like to know, then please just ask. Alternatively leave a comment below. A lot of material here that I shall enjoy wading through.. I think you mean “In the mid to late 70s”; note you do not need an apostrophe when mentioning decades, they are straightforward plurals. The only time they need an apostrophe when they are possessive, as in “Kraftwerk – a 70s’-style music band. Hope you are not offended by my little bit of pedantry. If I notice anything else I will let you know. Keep up the good werk! Nice looking site. Lots of info to trawl through. Interesting red and green concept – Die Mensch Maschine / Computerwelt colours!? With time I’ll be adding more.. I’m a relative novice to this web page building thing, so i like to think of things thst i can’t do and then do them. Version 1 of this site, back in 2000, I had yellow in place of the green.. but after a while i settled on the green.. it’s stuck since then. as always YOU ARE THE BEST. Great site and a must for every Kraftwerk fan.